Layers in Photoshop Elements 11 can make your file go from slim and trim to bulky and bloated. You not only create a larger file size that slows your computer system’s performance, but you’re also limited to the file formats that allow you to save layers: the native Photoshop format (.psd), TIFF (.tif), and PDF (.pdf). If you save your file in any other format, Elements smushes your layers into the background. This file limitation often forces users to save two versions of every layered file — one as a native Photoshop file and one as something else, such as EPS or JPEG, to import into another program. Merge layers: Combines visible, linked, or adjacent layers into a single layer (not a background). The intersection of all transparent areas is retained. You can also merge adjustment or fill layers, although they can’t act as the target layer for the merge. Merging layers can help decrease file size and make your documents more manageable. You’re still restricted to the layer-friendly file formats, however. Flatten an image: Combines all visible layers into a background. Elements deletes hidden layers and fills any transparent areas with white. Flattening is usually reserved for when you’re finished editing your image. Before you flatten an image, make a copy of the file with all its layers intact and save it as a native Photoshop file. That way, if you ever need to make any edits, you have the added flexibility of having your layers. You can merge layers in several ways. First, simply select the layers you want to merge in the Layers panel and choose Merge Layers from the panel menu or the Layer menu. In the Photo Editor, in Expert mode, ensure that all the layers you want to merge are visible in the Layers panel. 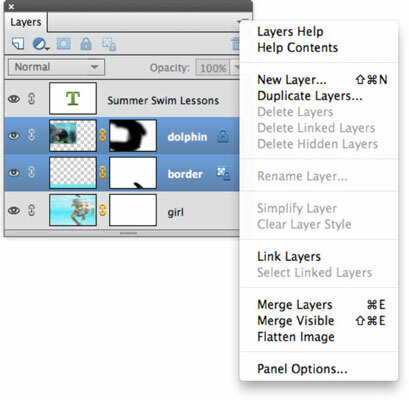 Choose Merge Visible from the Layers panel menu or the Layer menu. All visible layers merge into a single Background layer. Hold down Alt (Option on the Mac) when choosing Layer→Merge Visible. Elements merges those layers onto a new layer. 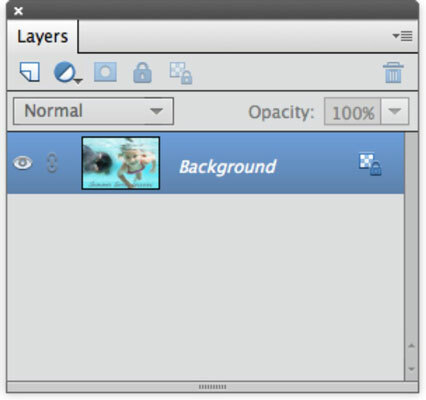 Position the layers that you want to merge adjacent to each other in the Layers panel. Select the top layer of the ones you want merged. Choose Merge Down from the Layers panel drop-down menu or the Layer menu. Note that Merge Down merges your active layer with the layer directly below it. One last merge command doesn’t appear in the menu but is accessible via the key command of Ctrl+Alt+Shift+E (Command+Opt+Shift+E on the Mac). This command creates a merged copy of your layers on a layer that sits above all the visible layers. In the Photo Editor, in Expert mode, ensure that all layers you want to retain are visible in the Layers panel. Elements discards all hidden layers. Choose Layer→Flatten Image or choose Flatten Image from the Layers panel menu. The transparent areas of flattened images fill with the background color and appear as a background in the Layers panel. If you mistakenly flatten an image, you can undo the command immediately by choosing Edit→Undo. If you go ahead and perform another action, undo your mistake by using the Undo History panel. However, note that if the flattening step is no longer in the Undo History panel, you have no way to undo the flattening.